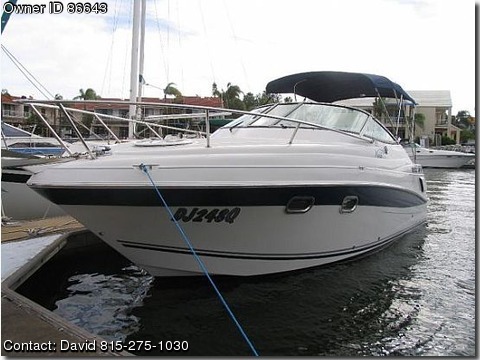 BOAT OWNER'S NOTES: We purchased this boat new in 2003, it is a one owner boat. We have only used the boat 3 years and the boat was serviced each year. When not in use the boat is stored indoors. We have now upgraded to a house boat. It has only been in fresh water. She is powered by a 5.0 gxi/dp 270hp w/volvo penra stern drive, ssprops, trim tabs, radio/cd player w/remote controls, transom shower, head w/standup shower, microwave, electric stove, electric./dc refrigerator, full carpet, c/o2 monitors, fire extinguishing system, 2 anchors, 4life vests, mooring cover, full camper canvas, sleeps 4 in cabin with room for 2 more in lounge area above deck, matching Four Winns tandem axle trailer with hydraulic surge brakes, 2 batteries. Bottom painted just before last use.